Dubnium is a chemical element with symbol Db and atomic number 105. A transactinide element, dubnium is highly radioactive: the most stable known isotope, dubnium-268, has a half-life of just above a day. This greatly limits the extent of possible research on dubnium. Dubnium does not naturally occur on Earth and must be produced artificially. The Soviet Joint Institute for Nuclear Research (JINR) team claimed discovery in 1968, and the American University of California team did so in 1970. Both teams proposed a name for the new element and used it without waiting for formal approval; similar controversies over priority of discovery occurred with elements 102–109. Attempts to resolve the dispute continued from the late 1980s through the 1990s; criteria for discovery were suggested by the IUPAC/IUPAP Joint Working Party and claims were evaluated against those criteria. Credit for discovery of element 105 was shared between the two teams; the American team protested, but was ultimately rejected. After several rounds of negotiation, names for the new elements were chosen; the final compromise named element 105 dubnium after Dubna, the site of the JINR. In the periodic table of the elements, dubnium is located in period 7, in d-block, thus being a transactinide element. Dubnium belongs to group 5 as the third member of the 6d series of transition metals. The limited investigation on chemistry of dubnium has demonstrated that behavior of dubnium was typical for group 5, and the element is established as the heavier homologue to tantalum in group 5; however, some deviations, particularly those from the periodic trends, occur due to the relativistic effects. The first discovery of an element heavier than uranium, the heaviest of the naturally occurring quantity elements—neptunium—occurred in 1940 by the University of California in Berkeley, California, United States. In the coming years, the American team undoubtedly synthesized the following elements up to mendelevium, element 101. 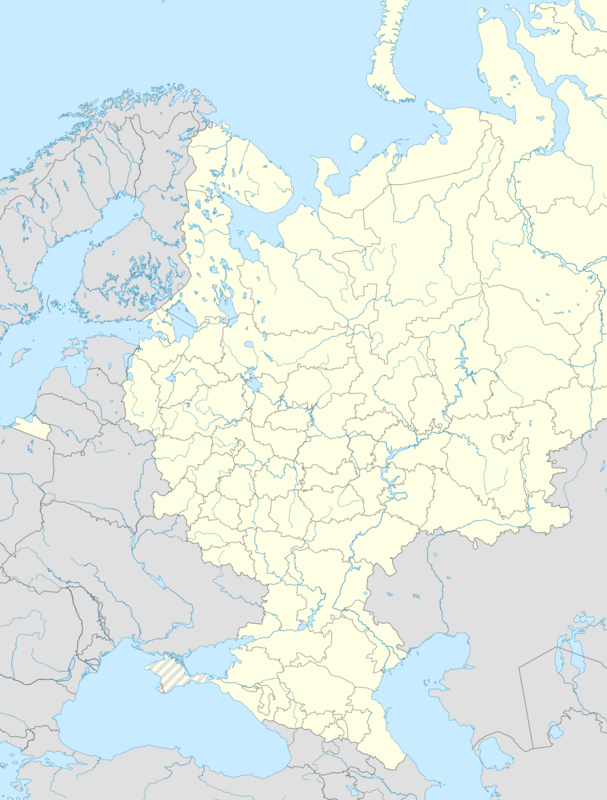 However, in 1956, the Joint Institute for Nuclear Research in Dubna, Moscow Oblast, Russian SFSR, Soviet Union, was founded and became a major rival to the American team. Their rivalry, heated by the ideological and geopolitical rivalry of their countries, which itself reached its peak in the 1960s, resulted in a race for new elements and credit of their discoveries, later named the Transfermium Wars. Investigation of the original reaction was continued; the research was aimed at looking for fission fragments of Z=105 isotopes. In February 1970, a following paper was published. Two activities were found, with half-lives of 14 ms and 2.2±0.5 s. The former activity was assigned to 242mfAm; the latter one was described as having been caused by an isotope of element 105. The idea that the latter activity could come from a transfer reaction and thus not be from element 105 was said to be diminished by the fact that the yield ratio for this reaction was lower than that of the 242mfAm-producing transfer reaction. The idea that this synthesis reaction was indeed a (22Ne,xn) reaction was grounded on research on the reaction of that beam with 18O; reactions producing 256Lr and 257Lr showed very little spontaneous fission (SF) activity (matching the established data), and the reaction producing heavier 258Lr and 259Lr produced no SF activity at all, falling in line with theory. A subsequent paper, released in May 1970, reported that this isotope was probably 261105, though the possibility of it being 260105 was not excluded. These results by the Berkeley scientists did not confirm the JINR findings regarding the 9.4 MeV or 9.7 MeV alpha-decay of dubnium-260, leaving only dubnium-261 as possible produced isotope. In May 1970, the first paper discussing chemical examination and confirmation of the supposed element 105 was published in Dubna. That work relied on the previous data from Dubna: the February 1970 paper. The thermal gradient version of the gas-chromatography method was applied to demonstrate that the chloride of what formed the SF activity in the aforementioned work nearly agreed with that of NbCl5, rather than HfCl4: therefore, this directed to an assignment to element 105. The team identified a 2.2-second spontaneous fission activity contained within a volatile chloride portraying eka-tantalum properties. In June 1970, the Dubna team made improvements on their original experiment, providing a purer target and intensity of transfer reactions reduced by using a collimator before the catcher. This time, they were able to find 9.1 MeV alpha activities with daughter isotopes identifiable as either 256Lr or 257Lr; thus, the original isotope was either 260105 or 261105. 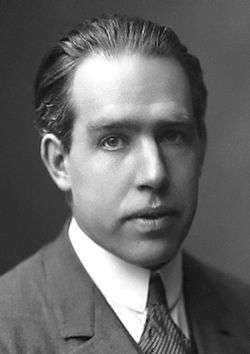 The element 105 was originally proposed to be named after Danish nuclear physicist Niels Bohr (left), with name nielsbohrium (Ns) by the Soviet/Russian team. 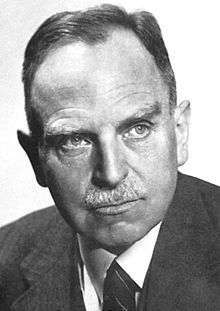 The American team initially proposed the element to be named hahnium (Ha) after German nuclear chemist Otto Hahn. The Soviet team proposed the name nielsbohrium (Ns) in honor of the Danish nuclear physicist Niels Bohr, one of the founders of the theories of the atomic structure and the quantum theory. The American team proposed that the new element should be named hahnium (Ha), in honor of the German chemist Otto Hahn, the "father of nuclear chemistry". An element naming controversy rose; consequently, hahnium was the name that most American and Western European scientists used and appears in many papers published at the time, and nielsbohrium was used in the Soviet Union and Eastern Bloc countries. However, tensions in the late 1960s and 1970s simmered down somewhat. Both teams synthesized the next element, element 106, but decided not to suggest their names. In 1968, the Soviet team presented a report calling recognition of discovery of elements 102 and 103 by other teams "hasty". Afterwards, they suggested establishing an international committee on elaborating the discovery criteria. This proposal was accepted in 1974; however, the newly formed Committee never assembled to assess the claims. The conflict remained unsolved, and in 1979, the IUPAC published a new suggested system of systematic element names (according to which element 105 would be named unnilpentium, from the Latin roots un- and nil- and the Greek root pent- (meaning "one", "zero", and "five", accordingly, referencing the atomic number) intended to be used as placeholders until permanent names were established; the scientists ignored it, not wishing to weaken their claims by adopting a neutral naming system rather than their own. In 1981, a third major competitor joined the race for superheavy elements—the Gesellschaft für Schwerionenforschung (English Society for Heavy Ion Research) in Darmstadt, Hesse, West Germany. They claimed to have synthesized the element 107; their report came out five years after the first report from Dubna did, but it provided further details not presented in that work. The German team joined with the Soviet team in that it suggested the name nielsbohrium for the new element, believing Bohr did deserve an element named after him, and hoping to ease the tension on the element 105 controversy. The Soviet team did not hurry to suggest a new name for element 105, stating it was more fundamental to first determine the discoverers of the element. In 1985, the International Union of Pure and Applied Chemistry (IUPAC) and the International Union of Pure and Applied Physics (IUPAP) formed a Joint Working Party (JWP) aimed at assessing discoveries and establishing final names for the elements in question. The party held numerous meetings with delegates from all three competing institutes; in 1990, they established criteria on recognizing an element and in 1991, they completed the work on assessing discoverer statuses and the party was disbanded. These results were published in 1993. According to the report, the first definitely successful experiment was the April 1970 experiment in Berkeley, followed closely by the June 1970 Dubna experiment; thus, credit for discovery of the element should be shared between the two competing teams. The American team dismissed the report. In an open response, they proclaimed that the input from the Russian team was overrated by the review. In addition, they claimed the Dubna team was able to undoubtedly demonstrate the synthesis of element 105 no earlier than a year after they did. The Russian and the German teams endorsed the report. The scientists from the former JWP rejected criticisms from Berkeley. In 1994, the IUPAC published a recommendation on naming the disputed elements following the previous reports. For element 105, they proposed the name joliotium (Jl), after the French physicist Frédéric Joliot-Curie, a significant contributor to the development of nuclear physics and chemistry; this name was originally proposed by the Soviet team for element 102, which by then had long been called nobelium. (The name nielsbohrium for the element 107 transformed to bohrium to conform the practice set by all then-current elements.) This recommendation paper was generally met with criticism from the American scientists: their recommendations were scrambled (i.e. the name rutherfordium, originally suggested by Berkeley for element 104, was used for element 106); both elements 104 and 105 were given names suggested by the Russian team despite earlier recognition of the Berkeley team as of an equal co-discoverer; and especially because the name seaborgium for element 106 was rejected for honoring a living person (Glenn Seaborg was an American nuclear chemist and a principal pioneer in the research on transuranium elements), a rule that had only just been approved. These names were to be accepted on a Council meeting in 1995. After a new term of negotiations between the parties, IUPAC decided to allow the name seaborgium for element 106 and changed the name of element 102 to flerovium after Soviet nuclear physicist Georgy Flyorov following the recognition by the 1993 report that the element had been first convincingly synthesized in Dubna (Flyorov discovered spontaneous fission and was another tremendously important pioneering researcher on the superheavy elements). However, this compromise was also rejected by the American scientists and the decision was retracted. A chart of nuclide stability as used by the Dubna team in 2012. Characterized isotopes are shown with borders. The first nuclei of dubnium were produced by reactions of direct nuclear fusion, in which two nuclei would fuse into one, possibly emitting a few neutrons. These first nuclei were very unstable, lasting often less than a second. However, there should have been more stable isotopes of dubnium heavier than those first synthesized, as the nuclear drip line moves towards greater relative neutron-richness of nuclei with the increase of the atomic number. Some of those isotopes have been produced since then with other reactions of fusion. However, as research on superheavy nuclei moved on, the heaviest isotopes of dubnium were produced only indirectly, but rather as the daughters of heavier nuclei that would decay via consecutive alpha decays to dubnium. −4 hours. The second most stable isotope, 270Db, has been produced in even smaller quanitites: three atoms in total, with lifetimes of 33.4 h, 1.3 h, and 1.6 h. These two are the heaviest isotopes of dubnium to date, and both were produced as a result of decay of heavier nuclei rather than directly. The reason for is that the experiments that yielded were originally designed in Dubna for using 48Ca beams. For its mass, 48Ca has by far the greatest neutron excess of all practically stable nuclei, both quantitative and relative, which, correspondingly, helps synthesize superheavy nuclei with more neutrons. According to the periodic law, dubnium should lay in group 5, under vanadium, niobium, and tantalum. A number of studies investigated what the properties of element 105 would be like. Those predictions generally match the periodic law. Significant deviations may nevertheless occur; these are due to relativistic effects, which dramatically changes physical properties on both atomic and macroscopic scale. These properties remain challenging to measure: only gas-phase studies have been performed so far on singular atoms; they generally prove the assignment of dubnium to the position under tantalum in the periodic table (see below). Relativistic effects arise when an object moves on velocities comparable to the speed of light. For example, as velocity of an object increases, so does its mass, which leads to decrease of the mean distance between the electron and the nucleus. Relativistic (solid line) and nonrelativistic (dashed line) radial distribution of the 7s valence electrons in dubnium. A direct relativistic effect is that as atomic numbers of elements increase, the innermost electrons begin to revolve faster around the nucleus as a result of the increase of the electromagnetic attraction between an electron and a nucleus. Similar effects have been found for s orbitals (and p1/2 ones, though this is not quite applicable for dubnium): for example, the 7s orbital is contracted by 25% in size and stabilized by 2.6 eV. A more indirect effect would be that the contracted s and p1/2 orbitals shield (take on themselves) the charge of the nucleus more effectively, leaving even less for the outer d and f electrons, which therefore move on larger orbitals. Dubnium is greatly affected by this: unlike the previous group 5 members, its 7s electrons are more difficult to extract from an atom than the 6d electrons, though these energy levels remain close to each other. Relativistic stabilization of the ns orbitals, the destabilization of the (n-1)d orbitals and their SO splitting for the group 5 elements. While after a removal of a single electron from a neutral dubnium atom, the remaining valence electrons in a singly ionized ion (Db+) should organize themselves in a 6d27s2 configuration, the doubly (Db2+) or triply (Db3+) ionized atoms eliminate the 7s electrons: this is the opposite order to that of its lighter homologs. Despite the changes, however, dubnium is still expected to use five electrons as its valence electrons; 7p energy levels have not been shown to influence dubnium and its properties. As the 6d orbitals are further destabilized compared to 5d ones of tantalum, and Db3+ is expected to have two d, rather than s, electrons remaining, the resulting oxidation state is expected to be unstable and even rarer than that of tantalum. The ionization potential of dubnium in its maximum oxidation state should be slightly lower than that of tantalum and the ionic radius of dubnium should increase compared to tantalum; this has a significant effect on dubnium's chemistry (see below). Dubnium atoms, when in quantity and in a free state, should arrange themselves in a body-centered cubic configuration, like the previous group 5 elements. The predicted density of dubnium is 29 g/cm3. The simplest case for computational chemistry is the gas-phase chemistry, in which a substance is treated as if it was a gas to eliminate the necessity to take interactions between molecules in account. Research by multiple authors has been undertaken on the expected highest chloride of dubnium, DbCl5: it has been calculated to be consistent with the periodic laws by exhibiting properties of a compound of a d-block element, for example, the molecular orbital levels indicate dubnium uses three 6d electron levels, just as it would be expected. One property DbCl5 is expected to show is its increased (compared to TaCl5) covalence: a decrease in the effective charge on an atom and an increase in the overlap population (between orbitals of dubnium and chlorine). Calculations for solution chemistry indicate that again, the maximum oxidation state, +5, will be more stable than that of niobium and tantalum, and the +3 state will be less stable than those of niobium and tantalum. Hydrolysis of cations of +5 is expected to continue to decrease within group 5; however, it is still expected to be quite rapid. Complexation of dubnium is expected to follow group 5 trends in its richness; calculations for hydroxo-chlorido- complexes have been conducted; they show reversal in the trend in the complex formation and extraction of group 5 elements, with dubnium being more prone to do so than tantalum. Early results on chemistry of element 105 date back to 1974 and 1976: a thermochromatographic system was used in Dubna. From these experiments, the researchers concluded that the volatility of dubnium bromide was less than that of niobium bromide and about the same as that of hafnium bromide. (It is not, however, certain that the detected fissions that accurately pointed that the parent was indeed element 105.) This could lead to a conclusion that Db behaved more like Hf than Nb. Next studies on chemistry of element 105 were reported over a decade later, in 1988. An experiment was planned in Berkeley to determine whether the most stable oxidation state of element 105 in aqueous solution was 5+. Sorption of element 105 on glass cover slips after fuming twice and washing with concentrated nitric acid, HNO3, was compared with that of tracers of the group 5 elements Nb and Ta and with the group 4 elements Zr and Hf produced on‐line under similar conditions: these group 5 elements are known to sorb on glass surfaces while the group 4 elements do not. Element 105 was demostrated to behave as a group 5 member and was thus confirmed as one. Its extraction behavior into methyl isobutyl ketone from mixed HNO3/HF solutions under conditions in which Ta was extracted but Nb was not was also investigated. Surprisingly, it was found that element 105 did not extract and that its behavior was more like Nb than Ta, indicating that details of complexing behavior cannot be predicted based only on simple extrapolations of trends within a group in the periodic table.
. Extraction of Db from HBr into diisobutyl carbinol, a specific extractant for Pa, with subsequent elutions with mixed HCl/HF and HCl was also investigated. The obtained extraction sequence Pa > Nb > Db was explained as a result of an increasing tendency to form non‐extractable complexes of multiple negative charge. Further experiments in 1992 confirmed the stability of the +5 state: Db(V) was shown to be extractable from cation‐exchange columns with alpha‐hydroxyisobutyrate, similarly to other group 5 elements and Pa; Db(III) and Db(IV) were not. In 1998 and 1999, new predictions were published: the sequence Pa >> Nb ≥ Db > Ta was predcited for extraction from halide solutions; soon thereafter, it was confirmed. 3). A later experiment studied volatilities of chlorides of dubnium and niobium were studied as a function of controlled partial pressures of oxygen. Formation of oxychlroides and general volatility was shown to be dependent on concentrations of oxygen; the oxychlorides were shown to be less volatile than the chlorides. Further experiments confirmed that result. ↑ While the modern theory of the atomic nucleus does not suggest a long-lived isotope of dubnium, claims were raised in the past that unknown isotopes of superheavy elements actually existed primordially on the Earth: for example, such a claim has been raised for 267108 of half-life of 400 to 500 million years in 1963 or 292122 of half-life of over 100 million years in 2009; however, neither claim gained acceptance. -4 hours for 268Db, it must be noted that the statistical law of large numbers, on which relies the regular determination of half-lives, cannot be directly applied due to a very limited number of experiments (decays). The range of uncertainty is an indication of that the half-life period lies within this range with the probability of the standard figure of 95%, which has been arbitrarily chosen to represent the probability of a true event. 1 2 3 4 5 6 7 8 9 10 11 12 13 14 15 16 17 18 Hoffman, Darleane C.; Lee, Diana M.; Pershina, Valeria (2006). "Transactinides and the future elements". In Morss; Edelstein, Norman M.; Fuger, Jean. The Chemistry of the Actinide and Transactinide Elements (3rd ed.). Dordrecht, The Netherlands: Springer Science+Business Media. ISBN 1-4020-3555-1. ↑ Oganessian, Yuri Ts. ; Abdullin, F. Sh. ; Bailey, P. D.; et al. (2010-04-09). "Synthesis of a New Element with Atomic Number Z=117". Physical Review Letters. American Physical Society. 104 (142502). Bibcode:2010PhRvL.104n2502O. doi:10.1103/PhysRevLett.104.142502. PMID 20481935. 1 2 3 4 5 6 7 8 "Discovery of the Transfermium elements" (PDF). Pure and Applied Chemistry. 65 (8). 1993. Retrieved 2016-09-07. ↑ Hoffmann, Klaus (1987). Можно ли сделать золото? Мошенники, обманщики и ученые в истории химических элементов [Can one make gold? Swindlers, deceivers and scientists from the history of the chemical elements] (in Russian). Nauka. pp. 180–181. Translation from Hoffmann, Klaus (1979). Kann man Gold machen? Gauner, Gaukler und Gelehrte. Aus der Geschichte der chemischen Elemente [Can one make gold? Swindlers, deceivers and scientists. From the history of the chemical elements] (in German). Urania. 1 2 3 4 5 "Responses on the report 'Discovery of the Transfermium elements' followed by reply to the responses by Transfermium Working Group" (PDF). Pure and Applied Chemistry. 65 (8): 1815–1824. 1993. Retrieved 2016-09-07. ↑ Öhrström, Lars; Holden, Norman E. (2016). "The Three-letter Element Symbols:". Chemistry International. 38 (2). doi:10.1515/ci-2016-0204. ISSN 1365-2192. 1 2 "Names and symbols of transfermium elements (IUPAC Recommendations 1994)" (PDF). Pure and Applied Chemistry. 66 (12): 2419–2421. 1994. Retrieved 2016-09-07. ↑ "Seaborgium Name for Element 106 Disputed". www2.lbl.gov. Retrieved 2016-09-07. ↑ Bera, Jitendra K. (1999). "Names of the Heavier Elements". Resonance. 4 (3). ↑ Hoffman, D. C.; Ghiorso, A.; Seaborg, G. T. (2000). The Transuranium People: The Inside Story. Imperial College Press. pp. 369–399. ISBN 9781860940873. ↑ "Names and symbols of transfermium elements (IUPAC Recommendations 1997)". Pure and Applied Chemistry. 69 (12): 2471. 1997. doi:10.1351/pac199769122471. 1 2 Karpov, A. V.; Zagrebaev, V. I.; Palenzuela, Y. Martinez; Greiner, Walter (2013-01-01). Greiner, Walter, ed. Exciting Interdisciplinary Physics. FIAS Interdisciplinary Science Series. Springer International Publishing. pp. 69–79. doi:10.1007/978-3-319-00047-3_6. ISBN 9783319000466. ↑ Emsley, John (2011). Nature's Building Blocks: An A-Z Guide to the Elements (New ed.). New York, NY: Oxford University Press. pp. 215–217. ISBN 978-0-19-960563-7. ↑ Evidence for a long-lived superheavy nucleus with atomic mass number A=292 and atomic number Z=~122 in natural Th, A. Marinov, I. Rodushkin, D. Kolb, A. Pape, Y. Kashiv, R. Brandt, R.V. Gentry, H.W. Miller, arXiv:0804.3869 (2008). ↑ Karpov, A. V.; Zagrebaev, V. I.; Palenzuela, Y. Martinez; Greiner, Walter (2013). "Superheavy Nuclei: Decay and Stability". Exciting Interdisciplinary Physics. FIAS Interdisciplinary Science Series. p. 69. doi:10.1007/978-3-319-00047-3_6. ISBN 978-3-319-00046-6. ↑ Botvina, Alexander; Mishustin, Igor; Zagrebaev, Valery; Greiner, Walter (2010-10-01). "Possibility of synthesizing superheavy elements in nuclear explosions". International Journal of Modern Physics E. 19 (10): 2063–2075. doi:10.1142/S0218301310016521. ISSN 0218-3013. ↑ Stoyer, N. J.; Landrum, J. H.; Wilk, P. A.; Moody, K. J.; Kenneally, J. M.; Shaughnessy, D. A.; Stoyer, M. A.; Wild, J. F.; Lougheed, R. W. (2007-05-01). 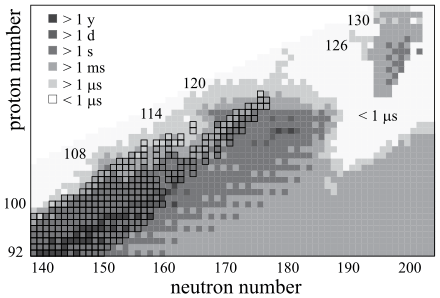 "Chemical Identification of a Long-Lived Isotope of Dubnium, a Descendant of Element 115". Nuclear Physics A. Proceedings of the Ninth International Conference on Nucleus-Nucleus Collisions. 787 (1): 388–395. doi:10.1016/j.nuclphysa.2006.12.060. ↑ Oganessian, Yu Ts; Abdullin, F Sh; Bailey, P D; Benker, D E; Bennett, M E; Dmitriev, S N; Ezold, J G; Hamilton, J H; Henderson, R A (2010-04-09). "Synthesis of a New Element with Atomic Number Z=117". ResearchGate. 104 (14). doi:10.1103/PhysRevLett.104.142502. ISSN 1079-7114. ↑ Khuyagbaatar, J.; Yakushev, A.; Düllmann, Ch. E.; Ackermann, D.; Andersson, L.-L.; Asai, M.; Block, M.; Boll, R. A.; Brand, H. (2014-05-01). "48Ca + 249Bk Fusion Reaction Leading to Element Z = 117: Long-Lived α-Decaying 270Db and Discovery of 266Lr". Physical Review Letters. 112 (17): 172501. doi:10.1103/PhysRevLett.112.172501. Wikimedia Commons has media related to Dubnium.